India’s Anti-Nuclear activists are justifiably upset about the “Convention on Supplementary Compensation for Nuclear Damage“, as everyone in India needs to be, along with everyone in the US, Japan, etc. However, when accusing America of foisting it upon India, there needs to be some fact-checking. Westinghouse has not been American for 16 years. Westinghouse is currently 90% Japanese (87% Toshiba; 3% IHI;) and 10% Kazakstan State owned (KazAtomProm). Before that it belonged to British Nuclear Fuels Limited (BNFL). GE Nuclear is, however, a GE-Hitachi partnership. Furthermore, this “nuclear deal” was brought to America and India by India’s very own. The new US Ambassador to India, Richard Verma, was born in Edmonton, Canada of parents from the Punjab area of India. Moreover, he worked as a Steptoe & Johnson lobbyist for the US-India Business Council to push the “U.S. India Civil Nuclear Agreement and radification of the 123 Agreement in compliance with the Henry Hyde Act,” along with “US-India Civil Nuclear Agreement’s 123 Bilateral Agreement in 2008.“ (radification appears a Freudian slip). Verma also lobbied for Cigna, an insurance company, who provides insurance for the workers at the Y-12 Nuclear Facility and may or may not be otherwise involved in the nuclear industry. It is interesting that one of the biggest nuclear pushers in the UK, “Baroness” Verma of Leicester, was born in India’s Punjab region. While Verma is a common name, this appears more than strange. A press release from Nov. 25, 2008 announced that Nuclear Energy Institute was partnering with the US-India Business Council for the “largest trade mission of US commercial nuclear executives ever to visit India“. That just so happens to be the year that Richard Verma was their lobbyist. And, it just so happens that when Verma got appointed Ambassador that this Convention was agreed or discussed again. It’s not clear if it was ratified or not. Perhaps they are simply back to discussions. The big question is who is behind this US-India Business Council and why are they working against the interests of both the American people and the people of India? Richard Rahul Verma prefers to be called “Rich”, we’ve read. Is wanting to be called “Rich” a hint of where his allegiance lies? Rich Verma: Traitor to the people of India and to the people of the United States. To whom does he pledge allegiance? The only beneficiaries of this Convention are those selling defective nuclear equipment(includes fuel), as Rosatom and/or its affiliate companies, have apparently done in India at Koodankulam. The US equipment makers-vendors, guilty or non-guilty, are supposed to pay for a disaster in India, (Japan and several other countries), exceeding the Price-Anderson amount. This seems to include the known to be defective Koodankulum, built by Russia. Already some US nuclear suppliers are grumbling and want the US taxpayer to pay for any accidents in India, Japan, etc. As payment into both this Convention and Price Anderson is retroactive, after an accident, most likely the US taxpayer will pay for a disaster at Russian built nuclear reactors, as well as any at French State Areva’s or Japanese Westinghouse, as well as GE-Hitachi which is apparently 60% American-40% Japanese in America and Hitachi-GE (60-40) in Japan (etc). Any accident in India, Japan, Romania, Argentina, Morocco, UAE, and the US pays a third. Romania has chosen CANDU nuclear reactors. Morocco may get Russian ones. Neither Canada nor Russia is member of this Convention so how can this be fair? In 1993-94 Rich Verma was working in Romania for the NDI. Romania is in the Convention. Who has been among those involved in Romania’s proposed new reactors? Who bought Romania’s large public steel works? A steel magnate from India named Lakshmi Mittal (Arcelor Mittal). There was an alleged “Cash for Influence, Mittal Affair” in relation to this purchase in Romania. Are we on to something here? Is this the hidden, rich, hand? Or, one of them? Steel for the construction of new nuclear reactors? Isn’t there enough waste that can be put in steel already? You know what this means don’t you? From our understanding, it means that Mittal will not be liable for defective steel parts, even if sub-standard steel is (or was) used. This is true of other suppliers, as well. Sub-standard pressure vessels, for instance! As well as many other parts and pieces. Why should the US equipment makers or taxpayer be responsible for a known to be defective Russian nuclear reactor in India? Or a French one? France is not part of this Convention, either. But they still are building nuclear reactors in India. If Mittal, or anyone else, sells (or sold) substandard steel for parts, especially nuclear pressure vessels, why should others pay? Why should those not involved in the defects be liable for those who are? And, certainly why should taxpayers or ratepayers be responsible? So, it’s a bad deal for India, since they are still allowed to sue and would lose that right, and a bad deal for America, including any honest vendors. It is a bad deal for Japan, as well as the smaller countries who have signed onto this shoddy deal. (e.g. Morocco, Romania, UAE, Argentina). It’s also a bad deal for India, because they would have to pay some part of the accidents in these other countries. One possible winner is Cameco Canada, located in Saskatchewan. Richard Verma was born in neighboring Edmonton, Alberta, Canada. Canada didn’t sign onto this Convention. It’s not clear if the US decided to make uranium miners pay into the liability pool or not, anyway. There is Cameco in America, but they can easily run back across the border and escape any liability. 1999: Westinghouse Electric Company officially began operations as BNFL’s nuclear power business. 2000: BNFL bought ABB Group’s nuclear power business, and merged into Westinghouse. 2006: Westinghouse acquired PaR Nuclear/Ederer Nuclear Cranes, providing fuel and cask handling equipment systems. 2007: Westinghouse won China National Nuclear Corporation’s bid for 4 AP1000 reactors including Technology Transfer agreement; acquired IST Nuclear of IST Holdings (South Africa); Carolina Energy Solutions (CES) and its affiliates Aggressive Equipment (AE), now WEC Machining; Construction Institute of America (CIA), now WEC Welding Institute; and Carolina United Services, now Carolina Union Services; Astare, a French nuclear engineering company headquartered near Paris. 2009: Westinghouse acquired Nuclear Fuel Industries LTD, Japan’s sole producer of nuclear fuel for boiling-water reactor and pressurized water reactors for $100 million and CS Innovations, LLC, an Instrumentation and Control (I&C) nuclear product supplier to the digital I&C safety system upgrade market. 2010: Westinghouse announced involvement in a new, ultra-large forging press in the UK to be built at Sheffield Forgemasters in Yorkshire; took a major stake in Springfields Fuel Limited in the UK. Westinghouse moved world headquarters from Monroeville, Pennsylvania, to Cranberry Township, Pennsylvania. “Slave-labour allegations and questionable safety records: Employees of Mittal have accused him of “slave labour” conditions after multiple fatalities in his mines. During December 2004, twenty-three miners died in explosions in his mines in Kazakhstan caused by faulty gas detectors. In 2002 Plaid Cymru MP Adam Price obtained a letter written by Tony Blair to the Romanian Government in support of Mittal’s LNM steel company, which was in the process of bidding to buy Romania’s state-owned steel industry. This revelation caused controversy, because Mittal had given £125,000 to the British Labour Party the previous year. Although Blair defended his letter as simply “celebrating the success” of a British company, he was criticised because LNM was registered in the Dutch Antilles and employed less than 1% of its workforce in the UK. LNM was a “major global competitor of Britain’s own struggling steel industry”. Up until around 400 years ago all of America belonged to American Indians (Native Americans). The areas just to the east of the Mississippi had the America Indians removed 185 to 200 years ago. In the western states it was about 100 years ago. American Indians are NOT related to people from India, except to the extent that all humans are related. American Indians (Native Americans) generally did not leave their homes willingly, and their holy sites are still subjected to land grabs for mining, with the complicity of the US government, the US Congress and President Obama. Non-Catholic Anglo-Irish who were in Ireland for around 400-800 years were often not considered Irish when Ireland got its independence back. Many Europeans who had been in North Africa for several hundred years were also not considered North African when those countries got their independence back and made to leave. Whatever anyone’s passport says, it should be clear that the country of origin has some cultural influence on the person for at least several generations, probably much longer. When parents and child are both born in a country, then one can start speaking of being part of that country, in most instances. With modern communications and transportation, and two and three nationalities, there is less incentive to become part of the resident country when people are economic migrants. Refugees with no hope of returning home can quickly become part of a country for they have cut old ties. All of this being said it seems that with his triple background Richard Verma is loyal to neither India nor to the United States. He can probably bail out to his place of birth, Canada, if need be. Obama said that only American Indians (i.e. Native Americans) can say whether or not they want more immigrants. Has he asked? It seems not. And, to be fair, this must include those Americans who are part Native American, but whose ancestors were not given reservation status, because they refused to move west and/or because they integrated into broader society (willingly or unwillingly). It needs to be clear to everyone that America is a colonial settler state. The Natives had little choice but to move, even when they were sometimes “paid” for the land. Those who migrated to the US around 150 years ago, sometimes less, are forced to participate, as they generally are not given right of return. Anyone who thinks that America is an “idea” and that they have the right to go there, needs to think again. Just because Europe used America as a dumping ground for its unwanted peoples, and Africans were forced there as slaves, doesn’t mean that everyone has the right to go there, even as the Native peoples still have so few rights. 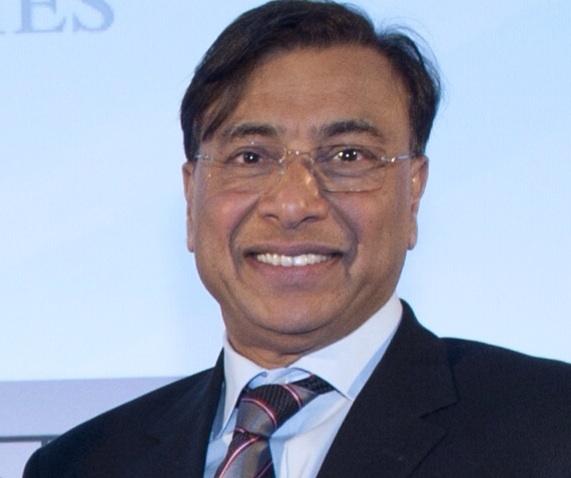 Lakshmi Mittal, CC-BY-2.0, Financial Times via Flickr, cropped.